Those of you who’ve found the blog this early probably know one or both of us. But few of you will have been introduced to the third member of the team. He/she/it’s not been christened yet – “the van” just sounds so impersonal, but a name will come when it comes. The last knockings of the Beetle in some ways, it’s rear engined, flat four (2.1 petrol), but watercooled, and a LOT bigger than the Bays and Splits. It’s kinda Transit sized, but because the engine’s under the back, there’s no big overhang at the front. Your feet are just behind the front indicators – which means virtually all of the length is usable space inside. Compared to the more normal later vans, there’s a chunk more space inside for about the same amount of outside size – which was nice, because it meant we didn’t have to decide between “common sense” and a bit of character. So what’s inside? A fridge, a two-ring cooker, a sink (with clean & waste water tanks and an electric tap), a petrol-fired night heater with timer, a table, two double beds (one upstairs, one downstairs), and a hopefully adequate amount of storage space. The front seats swivel round, so four can sit and converse inside, whilst the downstairs bed is a bench seat by day. A bike rack on the back is going to be home to a couple of bicycles – yes, pedal power, not the VeloSolexes… There’s a notion that we might even get a bit fitter out of this. Fresh into the UK when we bought it at the start of 2011, the van’s spent most of its life in Southern Germany, going by the paperwork we got with it. It’s tidy but not too tidy (especially since somebody <ahem> decided to test the relative strengths of German wheelarches and Derbyshire pub stone walls). At some stage, it’s been through a bit of a hippy phase – the whole of the lower half used to be metallic purple, it appears… It’s got somewhere around 230,000 km on it at the moment, and appears to be mechanically fit. That’s not to say there’s nothing to do – it’s getting a thorough service and going-over before departure, with anything and everything it may need being attended to. Famous last words, eh? You’re probably asking what’s happening with the rest of the fleet? They’re mostly hanging around. One of the 2cvs (Hetty the old grey van) has already gone to a thoroughly deserving new home. The other 2cvs (Sparky, the beige French van, and the Mehari) are staying, tucked into lockups. The Pug is staying as the sensible we’re-flying-back-for-a-weekend-and-need-transport standby. The Saab, though, has also gone to pastures new. This entry was posted in Van stuff. Bookmark the permalink. Bibendum is your mascot. 🙂 Is it LHD? That seems to make sense when you’ll spend most of the time outside the UK. What’s the origin of Club Joker? It seems a bit of an odd name or model designation. Yep, it’s LHD – not a problem for us, even in the UK – we’ve had enough cack-handers over here before. 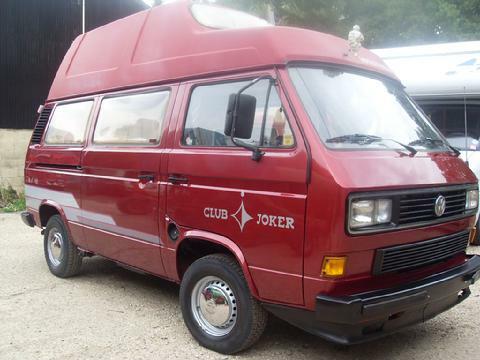 “Joker” is what Westfalia (VW’s “house” converter) called their conversions on these vans, and “Club Joker” just means a few more toys and nicer seats. If you fancy getting really anoraky, http://www.westfaliat3.info/ contains far more than you’d ever want to know. loving the van,have you given him/her a name yet?hope it doesnt let you down to many times,best of british, from the ledster clan in ilkeston,derbyshire. No, no name yet. Some of our cars give themselves names, others remain anonymous.